Description At 08h15 on Sunday, 11 June 1972 morning, with good visibility and dry asphalt, Bonnier was traveling in 8th place. Shortly after passing at Mulsanne corner, he was about to lap the Filipinetti-entered Ferrari 365GTB4 #35 of Florian Vetsch on the approach to the Indianapolis bend before Arnage. The Swiss amateur driver Vetsch, who was running in the middle of the road, didn’t realize Bonnier had arrived alongside him on the right side, the two cars running only inches apart. Vetsch closed the turn and Bonnier tried to avoid the Ferrari, passing with the right wheels on the green beside the track, but hit the other car, and rolled over. The collision launched him over the barriers, ending into the trees, Vetsch also crashed backward into the armco on the left side and the Ferrari, which fuel tank ruptured in the crash, erupted in flames. Vic Elford who was the first competitor to arrive to the place of accident, looking at the burning Ferrari, immediately stopped his Alfa Romeo 33TT3 and got out, trying to help the unfortunate driver. But he found the car empty, Florian Vetsch having already escaped unhurt. 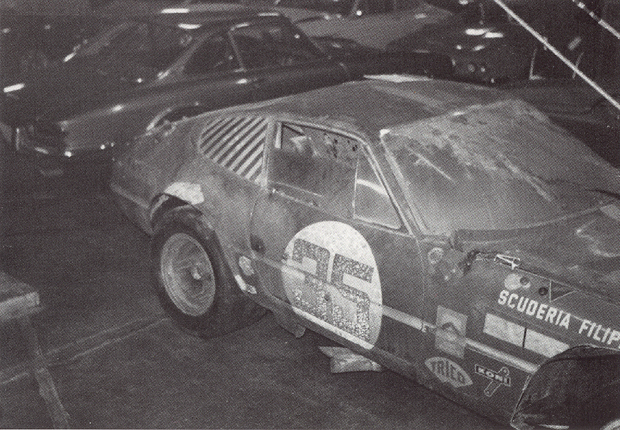 However, Bonnier's Lola was completely destroyed, debris from the car was spread among the trees. Joakim Bonnier was killed upon impact.